New research shows leaders are looking to maintain momentum in their CX initiatives. What’s the maturity level of most customer experience initiatives? Are organizations proactively using their customer insights? How effective are customer experience action plans? “What is Your Customer-Centric DNA?” is a longitudinal study that asked these questions and more to understand the state of customer centricity across North America. Since 2012, we have partnered with Janet LeBlanc + Associates to survey senior leaders across industries to gauge progress across five pillars of customer centricity. For the 2018 North American Study on Customer Centricity, we surveyed 118 senior leaders to measure the current state of customer experience management and development. Results were then compared to similar surveys conducted in 2012, 2014, and 2016. 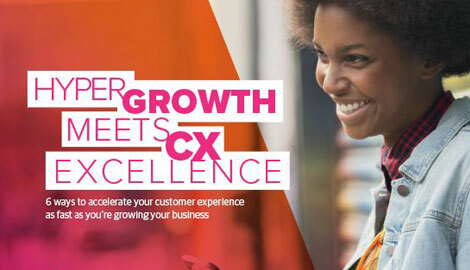 Survey responses were mapped along the Customer-Centric Index®, a composite of three measures used to map an organization’s degree of maturity across four phases of a journey toward true customer centricity. Respondents continue to be satisfied with the overall quality of their organization’s customer experience compared to others. However, they’re increasingly critical of their efforts to continue building a customer-centric organization. “An organization’s culture is extremely difficult to change, and customer centricity is often difficult for people to understand in concrete terms,” LeBlanc says. The research identified five areas of focus that are considered to be the building blocks of an organization’s customer-centric DNA. This year’s respondents struggled to maintain an upward trajectory across the five pillars of customer centricity, except for measurement and rewards. The largest dip occurred in senior teams spearheading customer-centric objectives. "By now, many companies use the Net Promoter Score and CX scorecards to measure progress, but many executives are still reluctant to attach their performance to a specific metric," LeBlanc say. "The desire to create a customer-centric organization is still strong, but maintaining momentum is a different challenge...and so leaders are finding themselves having to work harder to reach the next level," LeBlanc says. "Respondents were confident that their support teams promptly respnd to pressing issues -- which is great -- but it's not enough," LeBlanc says. "Companies also need to proactively identify and resolve issues." "Most organizations today collect customer feedback. Leaders need to guide employees on how to translate that feedback into actionable insights," LeBlanc says. "Otherwise employees are unsure what to prioritize and eventually disengage." "The good news is more companies are identifying attributes that are tied to CX and operational metrics," LeBlanc says. "What we need to see more of is linking insights to process metrics." True customer centricity takes more than an inspiring memo or mission statement. It’s an ongoing journey that requires collaboration and strong leadership. Most organizational leaders recognize this and acknowledge there’s still a lot of work to be done. As companies resolve relatively simple issues such as speeding up response times, it’s time to look beyond the low-hanging fruit. Reactive practices aren’t enough. How can companies be proactive and predictive? Are there opportunities to implement and scale more customer insights? At the same time, there’s a greater risk of stagnation as CX leaders struggle to maintain momentum. While there isn’t an easy solution, focusing on the five pillars of customer centricity (strategic alignment, senior leadership, customer insights, employee engagement, and measurements and rewards) and where they intersect gives organizations a significant advantage. As customer expectations and challenges rise, leaders will have to ask themselves whether they’re going to pursue customer centricity simply at a superficial level or whether they have the interests of the customer truly embedded within their business DNA.